On Tuesday's Today show, a couple of correspondents laid down the potential story line of a big defeat for Sarah Palin if the Republican Tea Party candidate she endorsed, Joe Miller, doesn't win his bid for the Senate seat in Alaska as NBC's Chuck Todd proclaimed: "Sarah Palin's political future is a little bit on the line" and added "this would be a big embarrassment," while NBC's Kristen Welker declared: "the race is also a referendum on Sarah Palin." Welker also featured a sound bite from a political analyst noting a Miller defeat would mean a "black eye" for the former Alaska Governor. Of course the question has to be asked, if Miller defeats write-in candidate Lisa Murkowski, will Todd and Welker go the other way and admit it was a huge win for Palin and the Tea Party? 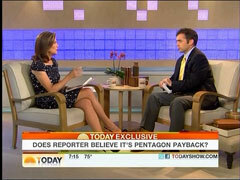 NBC's Today show invited on the reporter, whose Rolling Stone article essentially got General Stanley McChrystal fired, on Thursday's show to complain that the Pentagon denied him an embed because the war in Afghanistan isn't going well. After Today co-anchor Meredith Vieira questioned Michael Hastings for his explanation as to why the Pentagon denied him an embed, Hastings concluded "This is a symptom of essentially the war, and how the war is going...The war has hit its all-time low." This caused Vieira, herself, to cry censorship, as she asked: "Do you think the military is trying to say to reporters,'We will stifle you, if you don't tell the story the way we want it told?'" MEREDITH VIEIRA: So why do you think, ultimately, you lost this, this right to an embed? I mean, what do you think is going on? Is it the McChrystal article or is there something much bigger than that? MICHAEL HASTINGS: I think it's, I think it's much bigger. This is not just about a Rolling Stone reporter being banned from an embed. This is a symptom of essentially the war, and how the war is going. June and July were the deadliest months that we've ever seen in the war in Afghanistan. The war has hit its all-time low in approval ratings, so clearly there's great concern in Washington about how the war is going, and the response to this embed. The response to me on this embed sort of indicates that. I think it's important to, to just let you know, with this helicopter story, these are stories that I'm very passionate about telling. And it is a great privilege to tell the story of the troops. UPDATE: Not wanting to be left out of the Palin slamming scene, ABC's "Good Morning America" joined the fray on Nov. 4, interviewing the same people as CBS' "Early Show" and criticizing Palin on the same points. From accusing her of igniting a civil war within the Republican Party to calling her "nutty" antics a "treasure" to the Democrats, the mainstream media is once again shamelessly slamming Sarah Palin. On Nov. 3 CBS' "Early Show" interviewed Scott Conroy and Shushannah Walshe, co-authors of "Sarah from Alaska," a "very revealing" book about Palin on the campaign trail. "Later this month, Palin's highly anticipated memoir hits bookstores," said CBS' Harry Smith. "But another book beats her to it." To start off the interview, Smith asked Conroy (who, by the way, also works for CBS) to explain what was going on "behind the scenes" when John McCain gave his concession speech on Election Day last year. MARA SCHIAVOCAMPO: It's run by Ghanaian-American Coretta Owusu, whose father owns the business. She worked for this Obama during the campaign and then moved to Ghana to work for this one. It's a budget conscious hotel featuring 18 themed rooms priced at $60 to $100. CORETTA OWUSU, HOTEL MANAGER: And this room is the Obama suite. Most people stay here if they come for a special occasion or they're coming with their family. Well we have Michelle Obama right next to Barack Obama. Across from Obama it's Joe Biden's room.